Our ancestors spent thousands of generations living on the African Savannah. It shaped the evolution of our body1, but did it also influence the evolution of our mind? Many psychologists suspected as much since they’ve found many other evolutionary hangovers in our brains. Surely our ancient natural habitat also had an impact on our psychology. 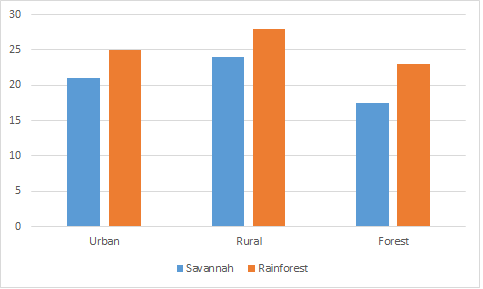 At a most basic level, we might expect people to prefer the Savannah over other environments. Initial results confirmed this hypothesis, showing that most people love a Savannah landscape. This choice held true in dozens of countries, with people picking images of the Savannah over other landscapes. Except for college students, who really liked the Tundra2. Maybe a barren, hostile, frozen hellscape reminded them of their upcoming career in academia. Aside from making a great joke set-up, these contradictory results also prompted skepticism of our apparent love of the Savannah. So Joelson Moura and other Brazilian researchers set out to see if those results hold up to scrutiny3. Weird undergraduates weren’t the only thing inspiring Moura et al. to investigate this research in more detail. In fact, they list a litany of confounding factors that makes much of this multi-cultural research suspect. The images used by Moura et al. I’m a big fan of F because it looks warm like Liverpool isn’t3. For instance, many studies only feature water in some images. We need water for survival, so we tend to feel positive around freshwater sources. This is another evolutionary hangover in our psychology that might bias the results towards those pictures with fresh water in them. Additionally, other studies only compared Savannah landscapes to a handful of others3. In the end, this often meant that the best research was the stuff done on Westerners. This makes the results rather dubious since they’re a WEIRD lot. How can we be sure this is a universal, evolved, preference and not just some strange artefact of watching TV. So Moura and colleagues set out to carry out their own test on our fondness for the Savannah, making sure to avoid all these issues they saw in other research. Ultimately, this involved testing how positively people in 3 Brazillian communities responded to a large range of environments3. These three communities were picked for living in different environments, ranging from people in a Forested National Park to farmers and city-dwellers3. So did this smorgasbord of Brazilians prove that people have an innate love of the Savannah? Quite the opposite. Crucially, each community had a slightly different ranking of the environments. This shows some inner love for one particular environment, but that our circumstances can strongly drive our preferences3. Which now I say it out loud sounds kind of obvious. That said, there were some consistent results across the study. People generally disliked urban and tundra environments, whilst favouring those with more vegetation. As such, rainforest pictures tended to score consistently high. Meanwhile, the Savannah was often towards the top of the list, albeit often beaten out by those lusher locales3. Could this show evolution is still influencing our psychology? We still seek out landscapes that would provide us with abundant food? Perhaps, but as good as Moura et al.’s work is it isn’t perfect. It still only carried out on Brazilians, after all. So we should avoid falling into the pitfalls of those who prematurely proclaimed Savannah was bae, and wait for further research. Cerling, T.E., Wynn, J.G., Andanje, S.A., Bird, M.I., Korir, D.K., Levin, N.E., Mace, W., Macharia, A.N., Quade, J. and Remien, C.H., 2011. Woody cover and hominin environments in the past 6 million years. Nature, 476(7358), p.51. Moura, J.B., Júnior, F., Washington, S., Silva, T.C. and Albuquerque, U.P., 2018. The influence of the evolutionary past on the mind: An analysis of the preference for landscapes in the human species. Frontiers in psychology, 9, p.2485.